Hi Everyone, Could you help me to decode this symbol placed on the back of a violin scroll? Thanks! Regards to All, B.
I am slowly trudging ahead to the day I can actually start carving my #1 violin. I have received a Strad Poster for the Messiah from a very generous member here, and will be making a "based on" not "copy of" the Messiah violin from it. The direction I have decided to go is to try and make it symmetrical, so I am "averaging" the measurements (where there are two values for sides, etc) from the poster and using that average for my drawing. Step one is to be the scroll and neck. Being me, I want to understand what I am doing, and so in digging around, I found Addie's drawings (THANK YOU!) and was going to use the Bett's Scroll drawing he provided (I assume Addie is a he?) I decided to check it against the photo on the poster. That led me to trying to figure out what the measurements on the poster mean - ie. the measurement is from what point to what point on the scroll, what landmarks can I count on while carving. Since I am averaging, I expect the drawing to be off a little - a few millimeters - but close. The following screen shots show my dilemma at this point, I could use some insight into what I am doing wrong (if anything). I KNOW I am over thinking it, but this violin is a teaching aide and my way of learning violin making from wood working to designing all of it. So, I really want to understand what I am doing as opposed to just charging forward making something that looks sort of right. The photo is of the poster and I uniformly scaled and rotated it to fit the guideline grid and adjusted the rotation using the neck line below the fingerboard. Any help in understanding why the grid and curves don't line up what the photo would be appreciated: How I setup the guidelines to check/draw the scroll. Here is what Addie's Bett's scroll looks like on that grid with a photo from the Messiah Poster. And here is what the Silverpoint Drawing from the Bett's file looks like on that grid. And finally here is my scroll on the grid. Hey everybody. I'm actually working on a cello based on Stradivari Forma B, the one that's supposed to be used to build the Gore Booth. I designed my scroll starting from the picture of the gore booth scroll shown on Sacconi book. Well, I've just finished to carve the second round and I'm about to connect the volute to the turn and I'm wondering about the width of that area, right after the throat. I've checked some measures about that point on violin and I've found out that it's around 26mm on Stradivari scrolls, but I found out nothing about cello scrolls. Don't want to make a copy, but I'd like to know if someone has any informations to get an impression of the development of the frontal line under the throat. It seems pretty impossible to get a picture of that area. I've attached a picture (hope the size will work well) to make you understand better which point I'm talking about. Such a pity that the scale of the scroll is not 1:1 Thank you all and have a nice Weekend Pietro. Unknown Cello Scroll - Any Insight ? Unknow Scroll - pic 1 Unknow Scroll - pic 2 Any insight as to origin or school (anything) would be much appreciated... The pegs have been brushed, head seems to be pinched, volute slow taper, conical eye large and prominent... I am stymied... Apologies as I was unable to download pics directly to the forum. Thanks in advance! Hi everyone, I'm currently building my second violin and loosely using a poster for the Del Gesu Alard. As a player I really notice when something is not right with the neck. There's a big discrepancy on where the scroll heel sits in reference to the end of the fingerboard/nut joint between my Johnson and Courtnall generic neck template and the strad poster that I'm referencing. The poster has the heel protruding maybe 2mm further into the neck. I do remember my last violin not feeling 100% comfortable in 1st position, but chalked that up to a pegbox that was too wide. My initial reaction is to follow the Johnson and Cournall template. What is a standard distance between the nut and where the pegbox heel ends? Is this a measurement that you meticulously check? Thanks in advance. 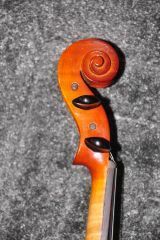 Hi everyone, I debated whether or not to post here, being completely new to violin making, but I figured some of you might be interested (and I could sure use the help!!!). If the mods disagree with my being here, I'm completely fine with deleting this thread. I'm Joe, aged 16, and I love violins! I was given pretty much all the tools I needed (those of you on Violins.ca/forums will recognise me. 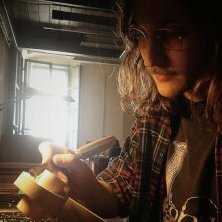 I'm not affiliated, just shedding light on my background) and I've started building a violin using un-finished/started parts from a deceased maker and one of my friends (who's a professional violin maker). I'm not building a kit, I wouldn't feel right using pre-made parts, but I can't afford all the wood so I'm using what I can get. The top and back were cut out before I was given them (but untouched by a gouge) and the neck was cut out along it's outline (both of which I've done before anyway) and the sides of the pegbox had been cut out (but not the neck or scroll). Anyway, here's what I've been doing today. It's far from finished, but I can make it look nice from what I've done so far. Any advice is very much appreciated. Thanks, Joe PS All your work has been very inspiring to me, I'd like to thank especially Melvin Goldsmith and CTviolin for their contributions to the site.